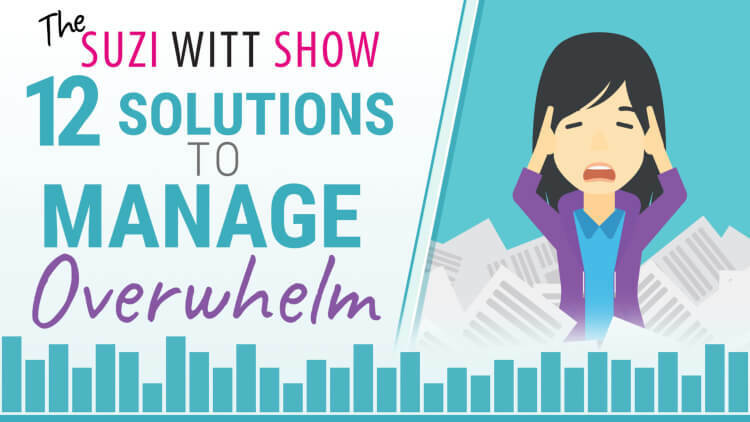 In episode 5 of the Suzi Witt Show, I am talking about overwhelm and your small business. Overwhelm is something that is always present waiting in the wings to pop out and grab you when you are at your most busy. For this podcast however, I focus on 12 solutions you can adopt to keep overwhelm at bay. Find out the 12 things Suzi does to manage her overwhelm. Learn about Chunking and how important it is for your business. Understand why a lack of white space will cause overwhelm to come back. Why being a working mum makes overwhelm even more likely to reoccur. Why comparison to other people can cause overwhelm and the dangers of comparing reality to idealised perfection. Why Suzi dumps social media on a fairly regular basis and what is bubblising. Why sometimes playing the "I don't care" card works to trick your mind. Why you need to take control of what you NEED to do rather than following what "gurus" tell you you should be doing. TSWS: 001 What is the Suzi Witt Show and Who Is Suzi Witt? Last of all, don't forget to SUBSCRIBE FOR FREE to the podcast in iTunes or Stitcher so you get notified on your phone each time a new episode is available.